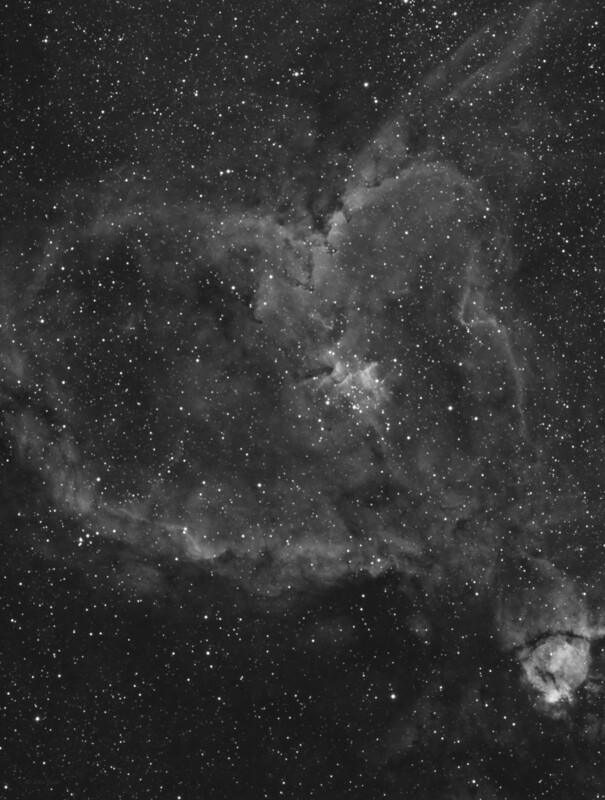 IC 1805, commonly known as the Heart Nebula is a star cluster that illuminates the large emission nebula SH2-190 in the constellation Cassiopeia. This cluster resides in the Perseus arm of our galaxy and the entire area is part of the Cass OB6 association. An OB association is a grouping of type O and type B stars which are massive and very hot young stars. IC 1805 is the star cluster in the center area of the image and is the source of illumination for the SH2-190 nebula. The entire nebula is very large at 140 x 110 arc minutes and I could not fit the entire object in my field of view. This cluster contains many O class stars and also one of the largest stars in our galaxy, HD 15570. The lower right of the image shows IC 1795 and just below that is NGC 896. IC 1795, aka the Fishhead nebula, is a bright emission nebula that conceals several very young hot stars. The source stars are not visible probably because they are concealed by dust. NGC 896 is the brightest nebula in the lower right of my image and is also an emission nebula.